B. Amsterdam, the largest startup ecosystem in Europe, totals up to 64,000+ square feet in workspaces, hosting 300+ companies as tenants and over 2,000 entrepreneurs as an initiative to bring startups, creatives, and corporates together. A distinctive ‘black cube’ on the Johan Huizingalaan, the location of the first B. Amsterdam building, was originally built as IBM’s headquarters. The adjacent hall served as a typewriter factory. After IBM left its premises, several developers prepared large-scale area development with office space as its main focus. The plan was to build an “extension of the Zuidas” (a major business district along the A10 highway) in this spot. These plans were eventually discarded, and the area (known as ‘Riekerpolder’) became one of the prime examples of a mono-functional office district like so many others that have emerged in recent years in the Netherlands. An unattractive proposition as it turned out, and “For Rent” signs disfigured many offices in this area, without any tangible result. Founders Guus, Ricardo and Bas decided to take action. The office building, with its excesses – large floors, accessibility, and robustness – afforded an opportunity to do things differently. Today, it is the lively center of B. where innovative entrepreneurs meet. ‘B.1’ houses 350 pioneering companies, rooftop restaurant Bureau, a rooftop park, coffee lounges, a cinema, and gym. After two years – and a completely filled building – B. opened a second building on 5-minute walking distance from the first building: B.2. Since the completion, the building has been empty for 11 years. At B.2 there are photo/film studio’s, creative agencies, incubators, and the B. Startup School Amsterdam. One year after opening B.2, it was completely leased and we opened our third building: B.3. This building was once built by Nissan and former Mexx headquarters, also on walking distance of the other two buildings. By adding this building, B. Amsterdam became the largest startup ecosystem in Europe today, with 40,000 m2. Like the other B. locations, the primary focus is on accelerating the pace of innovation and growth of startups and corporates. What is unique about B.3 is that it’s the physical center for corporate innovators in the Netherlands, granting organizations such as Akzo Nobel, BAM and IBM access to new talent for the development of innovative solutions. PostNL, a company that attaches paramount importance to innovation, has also opted for an innovation studio at B. Amsterdam. Currently, we have 3,500 members. We have a core team of 30 people, excluding facilities, the front desk, food & beverage, and restaurant. With those employees, the total number would be ~ 80. 1,000 – 1,500 people per day per building. When we hold big events this can go up to 3,000 people. Co-work space, enclosed offices, meeting units, lounges. We specifically serve startups/scale-ups with office spaces and early-stage startups and freelancers in our coworking space. Every building has one or two lounges where everybody can come together to have coffee, meet people and work. Our event spaces vary from meeting-units for 4 to 8 people to one-off event spaces for 1,000 people. Our events are very diverse, but all focused on themes around startups and innovation. This creates an always-changing broader community of interesting people for our members to connect with. On the rooftop of one of our buildings, we also have a cafe/restaurant. A lot of neighborhood corporate businesses come for drinks (and also lunch/dinner) and this was exactly the point – it’s open for everyone. We see it as a way to extend our community. More people touching the B. ecosystem. 26 event and meeting spaces, starting from six people up to 1,000. A rooftop restaurant, a rooftop park, cinema, photography/film studio. On top of our building, next to our restaurant Bureau, Moss takes care of an edible rooftop park with a kitchen garden, chickens, compost full of lovely worms and rainwater storage to water the plants and prevent flooding. With their passion for circular design, edible greenery and smart cities, they provide and care for all the plants in B. Amsterdam. But that’s just the beginning. Moss believes that future cities will be able to mainly feed populations on locally grown produce. Following the effort in making cities healthier and greener, the company wants to make production processes local and visible and strengthen the link between city dwellers and their food. Take the elevator to the fifth floor of B.1 and you’ll find a beautiful rooftop park overlooking the city. But there’s more! In August 2016 cafe restaurant Bureau opened its doors on the rooftop. B. always wants to offer the right spaces, tools and social environment for their members to support them with their growth. The restaurant can serve as a place for business meetings, but it’s also a spot where Amsterdam can connect with B.’s ecosystem. Therefore, the B. vibe, that’s guaranteed throughout the whole building, can now be experienced by everyone. Bureau is the perfect spot to build relationships, whether during a lunch or dinner with intimates or a business (coffee) meeting in one of its meeting units. It’s outside of the city center of Amsterdam, with a nearby metro, bus and tram stations. The airport is also very close by, less than a 10-minute drive. B. is a concept created by Ricardo van Loenen (now CEO) and Guus Meulendijks together with the owner of COD (Cradle of Development) Bas van Veggel (now Chief Real Estate Officer at B.). The plan for B. came from participation in a Skepp pitch. The building (now B.1) was empty for over 10 years. The pitch was created to come up with something new. They won the pitch, and together with the founder of BounceSpace, Jorn van Lieshout, Ricardo and Guus started this adventure. The biggest challenge for this building was the location and the size. It is located far from the city center. There had to be a strong, newly developed concept that provided value over other workspaces. The three founders started with a 350.000 EUR budget. They designed the tables and the lighting themselves and took a lot of leftover furniture from a school in nearby Amstelveen. It was all about being creative with a low budget. The approach was very hands on. The founders did all the work, together with one intern, who is actually still working at B. Amsterdam. We have everything to make sure our members are on top of their game. Everything you’d normally find in a city – a gym, a restaurant, a cinema – you can find all of this and more in the B. buildings. Why? Because we believe that being healthy in body and mind has a great impact on your work ability. All areas are largely filled with plants. Plants bring about positive effects on people. They are a means to decrease stress and enhance productivity. Interior plants lower operations and maintenance. 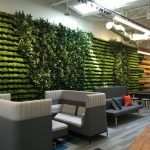 Plants in the workplace attract, retain and enhance the attention of today’s selective employee. In the B. buildings, you can also find art absolutely everywhere. Art inspires and unlocks creative potential. It affects the atmosphere of a room, improves employee experience and gets people talking. Art can shake up traditions and has the power to let people see things in a different light without limits. All the materials are “honest” materials. This means that the designers never fabricate materials. If it is meant to look like wood, we use it as wood. The designers are constantly looking for existing materials that they can put in a new environment which gives it a new function. One example would be the walls made of greenhouse construction. The walls have been technically adjusted to fit the needs of the customers. To clarify, there are special acoustic stickers on the glass and thick rubbers at the doors. Another example is the walls in B.1, which are created based on the remainder of the local excess glass. The signage, lots of greenery everywhere, lighting and recycled materials and colors. Art and quote tags, the vintage Trabant cars on various floors. It’s the combination of the different pieces of art, colors and green. The idea was to design the brand as an item in a magazine: we wanted it to become a topic people would talk about on birthdays. They would say to each other: “Have you seen the Trabant cars?” It all had to be mentionable and recognizable. Trabants as an icon but also as a place to take phone calls or meetings. Every piece of custom-made furniture has greenery put into it. There is a big rooftop garden with herbs and vegetables that are used for lunch. This is also the home of our three chickens that get to walk around all day and enjoy their lives at B. Amsterdam! There are sports facilities. Within this gym, existing structures or materials have gotten a different function. An escalator that has become a climbing wall is just one example. Also, there are a lot of places in the building where people can relax, little booths and swings, plus a gaming room.